Grand Slam Stringer Julian Li shares behind the scenes stories of Federer, Hingis, Nadal and Slam stringing! Julian Li is a professional stringer that has been on staff at 30 Grand Slam tournaments and put in thousands of hours stringing racquets for a majority of Tennis Pros that have played at the grand slam level. Named Stringer of the year in 2015, he is also the owner of Apex Racquet Werks his new tennis store in LaVerne, CA where he is an asset to the southern cal tennis scene. Many in the SoCal know Julian for his store in Arcadia Racquets Rackets which was opened in the 90s and is now run by his brother John. In the interview Julian shares some great stories about sharing an iPad with Roger Federer, Rafael Nadal’s attitude on tennis stringing, taking a picture with a young unknown Martina Hingis and shares a lot of behind the scenes tournament knowledge from the professional stringer perspective. Visit tennispal.com to download the tennis app everyone is talking about and access the show notes! Send an email to pk@tennispalapp.com for more information. Download from iTunes here Thanks for recommending and listening! Australian Open Review Fan Favorite Reports Djokovic Federer Murray Tsisipas Serena & More! A look back at the last Grand Slam and how the tennis landscape shifted in the hot Aussie sun. Fan Favorite Reporters deliver their expert opinions about Novak Djokovic dominant 3rd consecutive Slam win, Roger Federer’s early loss, Rafael Nadal in the finals again, Serena Williams exit, Stefanos Tsisipas meteoric run, Andy Murray’s hip condition, and pre-retirement tribute and a whole lot more. TennisPAL Chronicles is a tennis podcast to feed your passion for the game! We are tennis fans that interview tennis professionals and discuss tips, news, and reviews for your tennis obsession. Our global Fan Favorite reports are created by passionate fans who share news about their favorite players. Host Phillip Kim is the Tennis Pro at the historic Langham Huntington in Pasadena as well as the Director of Tennis for the City of Azusa and an avid player and coach. Visit tennispalapp.com to download the tennis app everyone is talking about and access the show notes! Send an email to pk@tennispalapp.com for more information. Download from iTunes here Thanks for recommending and listening! Interview with CEO Haleh Emrani. Listen to her story as she followed her passion from Tehran Iran to Los Angeles where she would become a regular in the USTA League matches and go on to develop a new tennis app with the hope of bringing the world together with the sport that she loves. 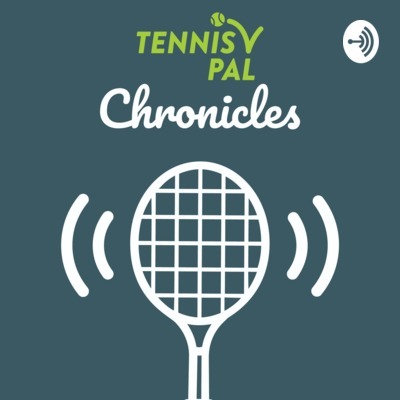 TennisPAL Chronicles is a tennis podcast to feed your passion for the game! We are tennis fans that interview tennis professionals and discuss tips, news, and reviews for your tennis obsession. Our global Fan Favorite reports are created by passionate fans who share news about their favorite players. Host Phillip Kim is the Tennis Pro at the historic Langham Huntington in Pasadena as well as the Director of Tennis for the City of Azusa and an avid player and coach. Visit tennispalapp.com to download the tennis app everyone is talking about and access the show notes! Send an email to pk@tennispalapp.com for more information. Download from iTunes here Thanks for recommending and listening! 2018 was a fantastic year for Tennis! We talk through the epic matches and Grand Slam wins that defined the tennis world. From Novak Djokovic return to world number 1 through the breakthrough women players like Naomi Osaka. Plus seasons greetings from our Fan Favorite Reporters and some updates on Andy Murray, Maria Sharapova, Serena Williams, Rafael Nadal and more. TennisPAL Chronicles is a tennis podcast to feed your passion for the game! We are tennis fans that interview tennis professionals and discuss tips, news, and reviews for your tennis obsession. Our global Fan Favorite reports are created by passionate fans who share news about their favorite players. Host Phillip Kim is the Tennis Pro at the historic Langham Huntington in Pasadena as well as the Director of Tennis for the City of Azusa and an avid player and coach. More information is available at www.lovesetmatch.net . Visit tennispalapp.com to download the tennis app everyone is talking about and access the show notes! Send an email to pk@tennispalapp.com for more information. Thanks for listening! As a former Pro WTA player and former Doubles partner and coach to Grand Slam Champion Sam Stosur, Sarah Stone brings a wealth of experience and stories to our podcast. An in-depth interview with CEO Sarah Stone on founding the Women’s Tennis Coaching Association and her views on the need for the Tennis world to adjust and improve how Women are coached in our sport. Due to the length and importance of this interview, this episode does not include a Fan Favorites Report section. Instead, we will be releasing a year-end Fan Favorite Report and Christmas special very soon! Stay Tuned! If you enjoy TennisPAL Chronicles, we would appreciate your positive review of our podcast on Itunes so more people can find our content. Please take a second to review our podcast here. Thanks so much for your support! Are you a Tennis Nerd? Title: We are all Tennisnerds! In part 2 of searching for the spirit of Stefan Edberg, we interview Jonas Erickson of Tennisnerd.net fame. Having grown up in Sweden, Jonas shares his insight into the country that swept all the Grand Slams in 1988. So what happened to Swedish Tennis? What happened to American tennis for that matter? We explore the country that has had such a deep impact on Tennis history with greats like Bjorn Borg, Stefan Edberg, Mats Wilander, Robin Soderling, and Magnus Norman to name a few. We also hear about the great content that Jonas is producing on his website, youtube channel, and blog. In our fan favorite reports, we welcome Jordan McMahon as our Maria Sharapova reporter and have full reports on Novak Djokovic returning to World No#1, Roger Federer winning Basel, Rafael Nadal with his freak abdominal injury and withdrawal from Paris, Serena Williams update and more. If you would like to become a Fan Favorite reporter and share news on your favorite player, send us an email at aces@lovesetmatch.net . This episode we are giving away some NIKE sweatbands to a lucky listener. To win just downloads the TennisPAL app and uses the code PODCAST (all capital letters) the first person who does this will receive a free NIKE Sweatband from LoveSetMatch just for listening. Thanks for your support! Azusa Team Up Tennis Invite! 2018 Azusa “Team Up” Tennis Tournament Ready for challenging competition, team camaraderie and a fun time on the courts?? Join the 1st Annual Azusa “Team Up” Tennis Tournament!! Sponsored by the USTA & TennisPAL Everyone registered will be assigned to a team of new friends and play to win! It's a great chance to play tennis with new people and share an awesome experience together. All levels welcome! Then after the tournament stick around for some free play matches! The tournament is open to the public and all levels are welcome! Date: Saturday, September 8, 2018 Time: 8:00 am to 12:00 pm Location: Northside Park, 599 W 12th St, Azusa, ca, 91702, us Cost: - Current Registered Azusa Players - FREE - All new visitors - $20.00 Street Parking is Free! (costs for the tournament cover prizes, snacks, new balls, etc.) USTA Prizes awarded for Top Team!! All registered participants receive a Premium Subscription Trial to TennisPAL app Breakfast snacks and beverages are provided.